Vendor Managed Inventory or VMI is a process where the vendor creates orders for their customers based on demand information that they receive from the customer. The vendor and customer are bound by an agreement which determines inventory levels, fill rates and costs. This arrangement can improve supply chain performance but reducing inventories and eliminating stock-out situations. With VMI, the vendor specifies delivery quantities sent to customers through the distribution channel using data obtained from Electronic Data Interchange (EDI). There are a number of EDI transactions that can form the basis of the VMI process, 852,855 and the 856. The EDI 852 information can be sent from the customer to the vendor on a weekly basis or more frequently in high-volume industries. The vendor makes the order decision based on this data in the 852 transmissions. The vendor reviews the information that has been received from the vendor and an order determination is made based on existing agreement between the vendor and customer. Many vendors use a VMI software package to assist them in determining order requirements. VMI software can be part of an ERP suite such as SAP or be a standalone option such as products from Blue Habanero, LevelMonitor, NetVMI or others. The software will verify if the data as accurate and meaningful. It will calculate a reorder point for each item based on the data and any customer information such as promotions, seasonality or new items. The quantity of each item available at the customer is compared with the reorder point for each item at each location. This will determine if an order is needed and the quantities required. Some vendors supply an advance ship notice (ASN) to their customers to inform them of an incoming order, which is known as EDI 856. The ASN differs from the purchase order acknowledgment in both timing and content. The 856 is sent to the customer after the shipment has been made instead of at the time of the purchase order. One of the benefits of VMI is that the vendor is responsible for supplying the customer when the items are needed. This removes the need for the customer to have significant safety stock. Lower inventories for the customer can lead to significant cost savings. The customer also can benefit from reduced purchasing costs. Because the vendor receives data and not purchase orders, the purchasing department has to spend less time calculating and producing purchase orders. In addition, the need for purchase order corrections and reconciliation is removed which further reduces purchasing costs. Cost saving can also be found in reduced warehouse costs. Lower inventories can reduce the need for warehouse space and warehouse resources. The manufacturer can gain some benefits from vendor managed inventory as they can gain access to a customers point of sale (POS) data makes their forecasting somewhat easier. Manufacturers can also work their customer's promotional plans into forecasting models, which means enough stock will be available when their promotions are running. As a manufacturer has more visibility to their customer's inventory levels, it is easier to ensure that stock-outs will not occur as they can see when items need to be produced. The bottom line is that an optimized supply chain means that you are delivering to your customers what they want when they want it—and accomplishing that by spending as little money as possible. 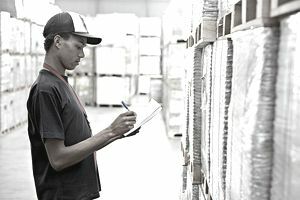 Using vendor managed inventory is a purchase order and inventory replenishment tool that some companies use to get that done.